In January 2017 Pope Frances blessed six statues of Our Lady of Fatima to be sent to the 6 continents. The Holy Father has declared 2017, the hundredth anniversary of Our Lady apparitions in Fatima to be a jubilee year. A Plenary Indulgence is granted to all who take part in the celebration. 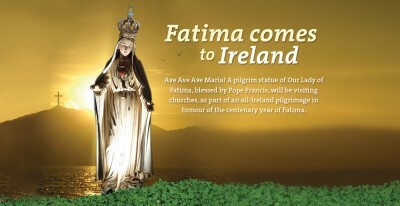 The European centennial statue of Our Lady of Fatima is visiting Ireland from the 3rd to the 29th March. It arrived in Armagh Cathedral on the 3rd of March and will visit Ulster, Leinster and Connaught before arriving in Munster. It will be in Munster from the 24th to the 29th March. 12 noon Mass, St Mary’s (Parish Church). Procession prior to mass. 8pm mass in Cobh Cathedral celebrated by Bishop Crean. 12am midnight – Mass at the Benedictine Convent, The Mount, Cobh followed by a vigil until 7am. 9.30am Arrival of Our Lady of Fatima Statue at The Holy Rosary Church where the statue will remain for the duration of 10am Mass. Arrival of Our Lady of Fatima Statue for 10am Mass in the parish church.